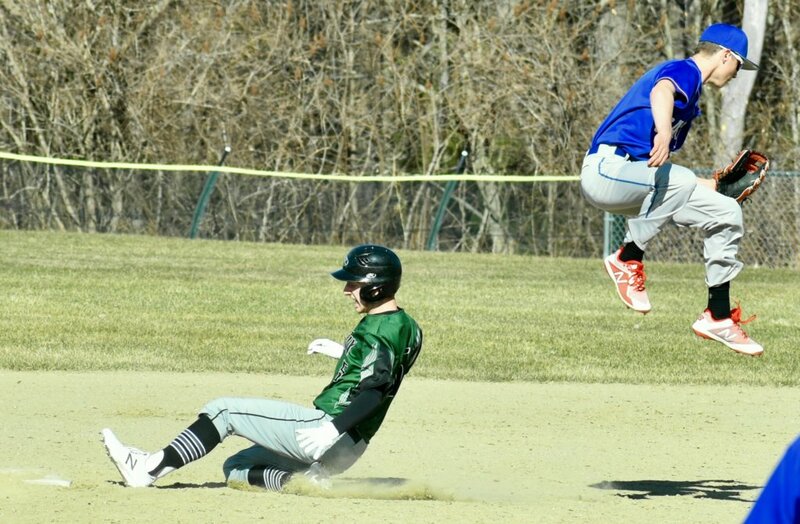 Spruce Mountain first baseman Jordy Daigle slides safely into second base as Oak Hill shortstop Gavin Rawstron leaps in a Mountain Valley Conference baseball game at Griffin Field in Livermore Falls on Monday. The Phoenix won the game, 16-6. Spruce Mountain coach Brian Dube echoes the frustration of many baseball coaches in the area when it comes to the staggering start to the 2018 season. “We’ve got to play at some point. This is killing us,” he said. Two of the Phoenix’s first three games were postponed due to rain since last Friday’s scheduled opener against Mountain Valley. They made their return to the Mountain Valley Conference official on Monday with a 16-6 win over Oak Hill. But both the home game against the Falcons and Wednesday’s game at Telstar were rained out. Wednesday saw another flood of washouts on the schedule, with lingering showers threatening to make more fields unplayable on Thursday and Friday. Coaches probably think Mother Nature is starting to pile on after winter clung to the region well into April and forced them to scramble to get on the field in preseason. “We’re lucky we got to play St. Dom’s and a couple of other teams in the preseason,” Dube said. MVC teams, most of whom were scheduled to start the season last Friday or Monday, have been the most impacted by the weather. Dirigo, Lisbon, Monmouth, Mountain Valley and Telstar had only played one game going into Thursday. In the Western Maine Conference, St. Dom’s had its opener against Sacopee Valley postponed from Wednesday to Thursday. Gray-New Gloucester had just one game under its belt, a 20-0 win over Waynflete, before Wednesday’s game at Poland was postponed. By contrast, Poland, which started its season on April 12, had three games checked off on its schedule through Wednesday. All of the games were on the road. Leavitt had completed all four of its scheduled games, including Wednesday’s 3-2 loss at Maranacook. Teams have moved games, either swapping home dates or agreeing to play at a neutral site, to get on the diamond. Having a field that’s fit for play doesn’t guarantee it will be used, though. According to Dube, Griffin Field was playable for Friday’s game with the Falcons. The Phoenix had practiced on it a couple of times last week, and he and Falcons coach Steve Lapointe had agreed to swap home dates because the field in Livermore Falls was more ready for game action than Rumford’s Hosmer Field. But the softball field at the Jay campus was not playable, so both games were postponed. “I know (athletic directors) don’t like to send two buses out, but we’re in a little different situation (with fields located in different towns),” he said. The Phoenix could be playing eight games in less than two weeks to get the make-up dates in. Other teams facing the prospect of playing 14 or 15 games in five weeks could be in the same boat. Schedules are already packed with three games a week in May, and while the Maine Principals’ Association would likely grant an extension to the season for lingering makeup dates (May 30 is currently the last day for countable games. Tournament prelim games start June 5), pitching staffs are sure to be stretched thin. The kids are doing alright for 3-0 Edward Little, which is one of three unbeaten teams in the conference, along with co-favorites Bangor and Oxford Hills. Coach Dave Jordan had three sophomores and two freshmen in the lineup for Monday’s 11-4 win over rival Lewiston. Key contributors included freshman Colin Merritt, who had two hits, and sophomore Jake Arel, who tossed three innings of hitless relief. Sophomore Austin Brown had three hits in the season-opening 5-1 win over Hampden Academy, then cracked three hits, scored three runs and drove in four more in a 15-3 win over Camden Hills. Despite its youth, Jordan has liked his team’s poise and commitment to his fundamental approach to the game.